Lance Armstrong could be stripped of his seven Tour de France titles and handed a lifetime ban by the US Anti-Doping agency, with the rider stating today that he has decided not to contest USADA’s charges against him. In June the Texan was charged with a range of offences, including the personal use of doping products and also encouraging and aiding others to do the same. He attempted to fight USADA in the federal courts but that approach came to an end last week when the judge, Sam Sparks, said it was not his court’s jurisdiction to deal with the matter. Armstrong had until today, August 23rd, to decide whether he would fight the charges or not: he has taken the latter option, and blasted USADA while doing so. foundation and on me leads me to where I am today - finished with this nonsense,” Armstrong wrote in a statement. “I had hoped that a federal court would stop USADA's charade. Although the court was sympathetic to my concerns and recognized the many improprieties and deficiencies in USADA's motives, its conduct, and its process, the court ultimately decided that it could not intervene. Armstrong continued by claiming that there was no physical evidence to back the claims, and that he passed ‘hundreds’ of controls. He protested the fact that USADA’s investigation has extended past the statute of limitations of eight years (something USADA says it can do under rules relating to doping conspiracy) and also claimed that USADA has made improper deals with other riders who have testified against him. “The international bodies governing cycling have ordered USADA to stop, have given notice that no one should participate in USADA's improper proceedings, and have made it clear the pronouncements by USADA that it has banned people for life or stripped them of their accomplishments are made without authority,” he added. However the UCI told VeloNation in recent days that it accepted the federal court’s ruling and would no longer block the USADA investigation. Armstrong was expected by some to contest the charges via arbitration but others speculated that damaging evidence could emerge during the hearings. USADA had said that it had amassed a compelling body of evidence, including witness testimony from up to ten former team-mates, and that it was confident in its case. It is yet to comment on Armstrong’s statement. Although he tested positive for a corticoid in 1999 and was six years later accused of having used EPO in that same Tour after B sample retests, Armstrong was not officially charged with any doping offences during his actual career. Disciplinary action was avoided when the team produced a TUE (therapeutic usage exemption) for the former, later claimed to have been backdated, while the UCI said it would not open a disciplinary procedure over the EPO allegations as it considered proper protocol was not followed. This was due in part to the absence of a corroborating A sample. Anti-doping expert Michael Ashenden later told the NYVelocity website that he had no doubts at all that the Texan’s values proved EPO use. 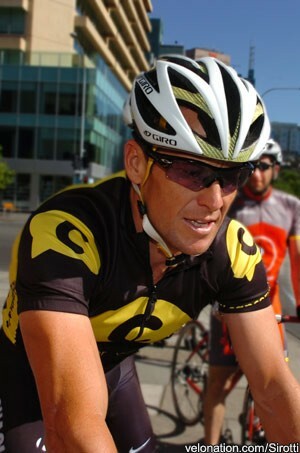 Armstrong denied the claims, and said that he had never doped. He retired from the sport after taking a seventh Tour title in 2005 but returned to competition in January 2009 when he rode the Santos Tour Down Under. He went on to finish third in that year’s Tour and rode one more in 2010, crashing and eventually finishing back in 23rd place. He retired again in February 2011, later returning to triathlon. In May 2010 Armstrong’s long battle against the current doping claims began when emails written by former team-mate Floyd Landis and sent to various cycling and sporting bodies were published. In those mails, he admitted doping during his career but also laid out damaging accusations against Armstrong, the US Postal Service team, several team-mates and team staff such as Johan Bruyneel. These claims became part of a federal investigation into the rider and the team, led by federal agent Jeff Novitsky and using evidence gathered in the US and in Europe. Other former US Postal riders reportedly testified, with up to ten said to have collaborated what Landis has said. Tyler Hamilton was one to speak out publically, while the others were said to have spoken to investigators. USADA took up the reins, investigating Armstrong and others in relation to doping suspicions. He and five others were eventually charged with a number of offences on June 29th. Armstrong tried to overcome the USADA investigation via a federal court in Texas, but the judge Sam Sparks dismissed the case last week. He said that Armstrong had agreed to arbitration when he had taken out his racing licences and that it was not the federal court’s jurisdiction to block that process. Armstrong had until today, August 23rd, to either choose arbitration or not. In the case of the latter, he would be then liable to USADA’s proposed penalties of a lifetime ban and the loss of up to seven of his Tour titles.